Risa Lavizzo-Mourey’s light bulb moment came during her medical training, when she was doing her rotations at a hospital in Boston. There, she met “Patient Ruth.” Ruth was homeless — she came into the hospital with swollen feet and skin ulcers that made it terribly painful to walk. She’d been in and out of the hospital many times, her medical file bulging with records. A day after Lavizzo-Mourey, who’s now the president and CEO of the Robert Wood Johnson Foundation, first met Ruth, the patient was discharged. The hospital had done its job, giving Ruth a warm bed for the night, some food and basic health care. But as Ruth left the hospital, she still had no home, no job, no access to healthy food, no social support. None of the conditions that make for healthy people and healthy communities would meet Ruth outside that hospital door. Unfortunately, she would most certainly return in need of more help. 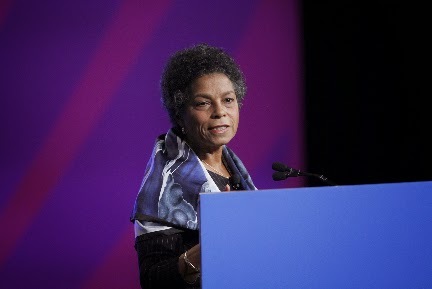 But what if instead of ushering Ruth back out into the cold, the hospital had connected her with the very services and support that could keep her out of the hospital, Lavizzo-Mourey asked a crowd of hundreds at the Closing General Session of APHA’s 142nd Annual Meeting and Exposition, which welcomed more than 12,500 people to New Orleans. Why wasn’t preventing a re-admission the fundamental goal of every visit to the hospital, she wondered. It was a transformative moment and one that redirected Lavizzo-Mourey to the world of public health, where she’s now a leader in the movement to build a nationwide culture of health. “The effects of where you live are so profound that your ZIP code may in fact be as important as your genetic code in how well and how long you live,” she told attendees. So, what does a culture of health look like? Imagine a society in which promoting health is as important as treating disease, Lavizzo-Mourey said. Imagine a world in which doctors openly share medical notes with their patients and engage in honest discussions about the value and price of care. Imagine neighborhoods and cities where optimal child health is a matter of fact — not a matter of chance. Imagine families and towns in which employers, policymakers and teachers all work together to help make the healthy choice, the easy choice. This is what a culture of health looks like, Lavizzo-Mourey said, and it is achievable. “It’s a bold idea and it’s one that I believe is possible,” she said. Of course, there are many challenges and the current data on Americans’ health is not particularly encouraging. But if we put our heads together and commit to reaching out and partnering with nontraditional public health partners, we can build a culture in which all people can access the opportunities that afford lifelong health, Lavizzo-Mourey said. And this year’s host city of New Orleans is the perfect inspiration. After the devastation of Hurricane Katrina, public health leaders decided the best way to rebuild the city was to put it on a trajectory to become one of the healthiest cities in America. In turn, public health officials reached across sectors, convening partnerships, leveraging knowledge and resources, and integrating health as a consideration in everyday policymaking. That shift in thinking is “part of the incredible comeback spirit that we felt in every corner of this town for the last week,” Lavizzo-Mourey said. Building a culture of health and the importance of partnerships were common themes throughout today’s Closing General Session. 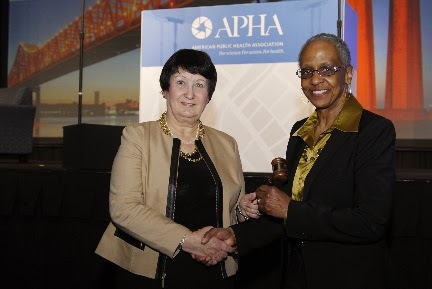 In fact, both philosophies are central to APHA’s strategic priority of building the healthiest nation in one generation. J.T. Lane, assistant secretary at the Louisiana Department of Health and Hospitals Office of Public Health, called on state health agencies to strengthen their support and advisory role in local communities. For example, he encouraged session attendees to help communities identify local public health champions and nontraditional partners. However, he added, be cognizant of local dynamics and help communities tailor efforts that will grow and sustain over time. Mary Wakefield, administrator of the U.S. Health Resources and Services Administration, echoed those sentiments but from a rural perspective. Contrary to some popular thought, Wakefield noted that living in rural America isn’t always “a ticket to longer or healthier lives.” In fact, life expectancy has been consistently lower in rural areas than in urban areas and that gap is widening. “If your ZIP code is a rural one, one’s health status might be at particular risk,” Wakefield said. Rural communities face a number of challenges to building a culture of health, including less access to care and high rates of poverty. But these challenges are ones that can be overcome, Wakefield said. Indeed, the notion of “pulling together” is a strong one in rural neighborhoods and a strength of rural communities overall. In rural America, health really is everyone’s business, she said. Howard Koh, former U.S. assistant secretary for health and a professor at the Harvard School of Public Health, told session attendees that with the implementation and success of the Affordable Care Act, it’s the perfect time for a paradigm shift in how our country thinks about health and prevention. Of course, none of this work is easy, he said. (On that note, Koh said: “Blessed are the flexible so we shall not be bent out of shape.”) Still, there’s no more important work than improving and safeguarding the health of our nation. “When prevention works, you get to enjoy the miracle — the absolute miracle — of another perfectly healthy, normal day,” Koh said. And so let’s end another energizing Annual Meeting with a challenge from new APHA President Shiriki Kumanyika, who called on her hundreds of colleagues at the Closing General Session to join APHA’s movement to create the healthiest nation in one generation. In particular, Kumanyika urged attendees to reach out and partner with the for-profit sector. Private sector action is integral to improving health and in pushing forward on issues such as climate change and health equity — in fact, public-private partnerships hold “incredible potential for accelerating our movement,” she said. Indeed, it’s to public health’s own detriment that it overlooks the power of the private sector to improve the nation’s health, she told attendees. We hope you’ll join that conversation, too. Visit APHA and sign our pledge to help build the healthiest nation in one generation. 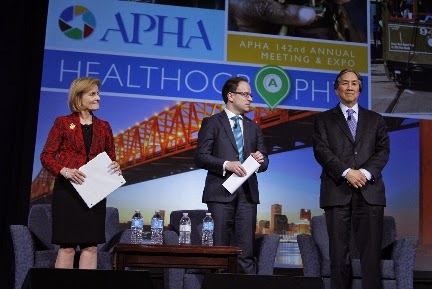 And we’ll see you next year in Chicago for APHA’s 143rd Annual Meeting and Exposition, where the theme will be “Health in All Policies.” Until then, be healthy!